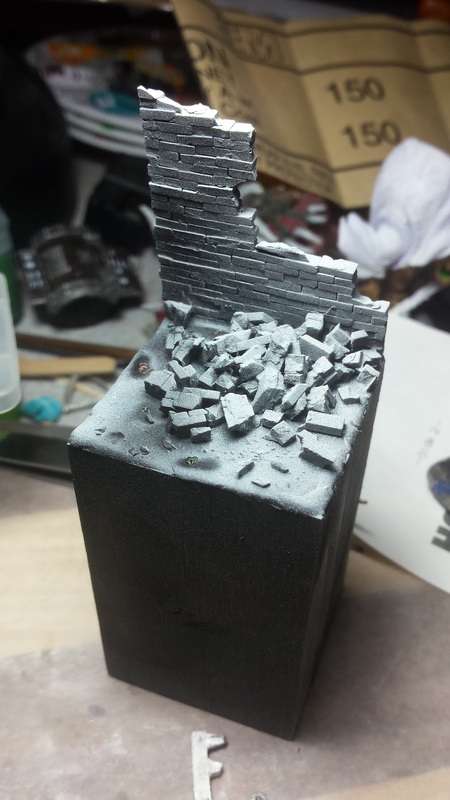 The wall is built and exploded, the minis are assembled and ready for battle. It's time for paint y'all! I came to an impasse for most of the day after the wall was assembled. I needed to decide on the ground, wall and camo colors. I spent a lot of time looking at camo patterns, trying to decide on what to go with. 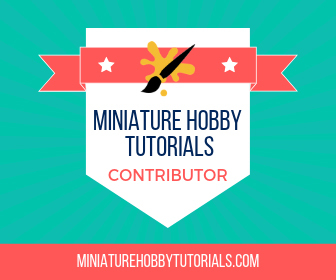 I made it especially difficult on myself, because I originally planned on a red brick wall. This left me with a limited number of camo choices and it was brought to my attention that Urban Camo against red bricks might look off. 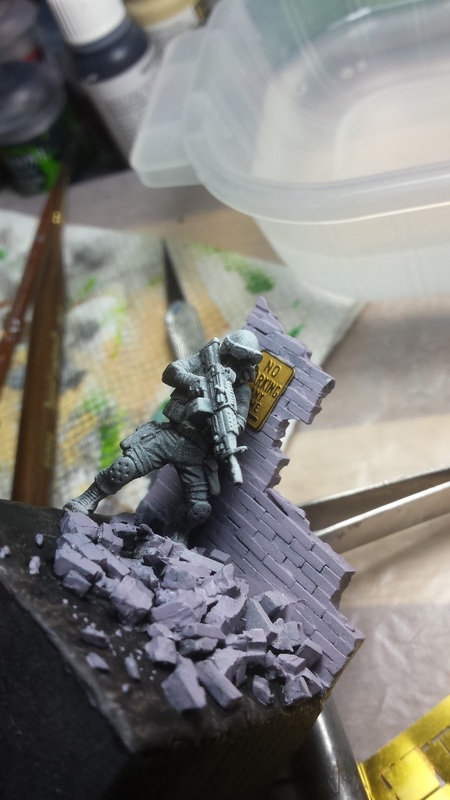 So, after a bit of debating I finally decided on grey bricks for the wall and a blacktop ground with the soldiers clad in grey urban camo. I then begain painting the ground with Vallejo German Grey. This was then splotched with various bieges, greys, black and white to give it a little bit of a varies surface effect. I followed that up with a glaze of Vallejo Black to bring it back to a darker tone. Nuln Oil and did a bit of drybrushing to it. 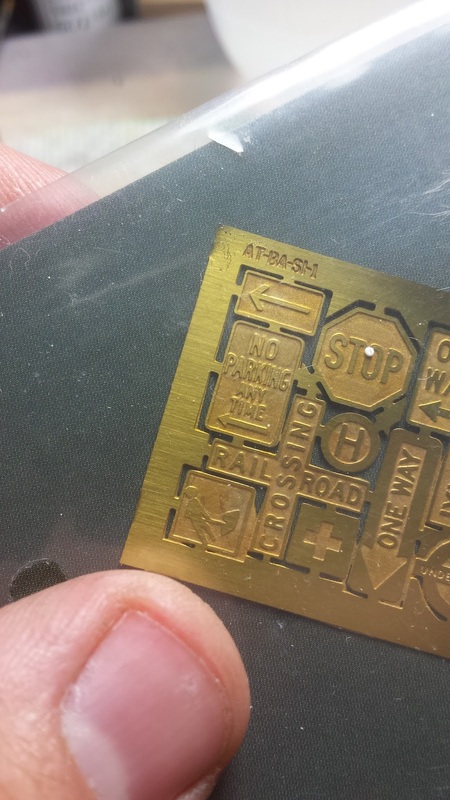 While I was working with the wall, I remembered that I had bought some etched brass street signs from Hasslefree Miniatures for use with Do Not Pass Gandalf, and searched through the bitz drawer for them. That's when I found the No Parking sign, and I knew I needed to add it to the wall. from behind it too, so I added a bit of red to the white areas, like the paint was starting to fail. 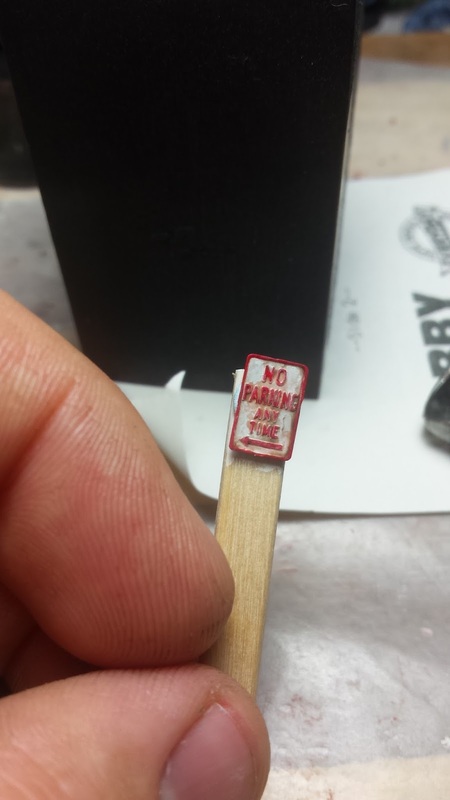 The No Parking sign turned out nice too and adds a lot more character to the piece. It also helps set the scene a bit more, because now you know that these guys are either in a parking lot or parking garage. Rather than standing next to some random wall in the middle of nowhere. 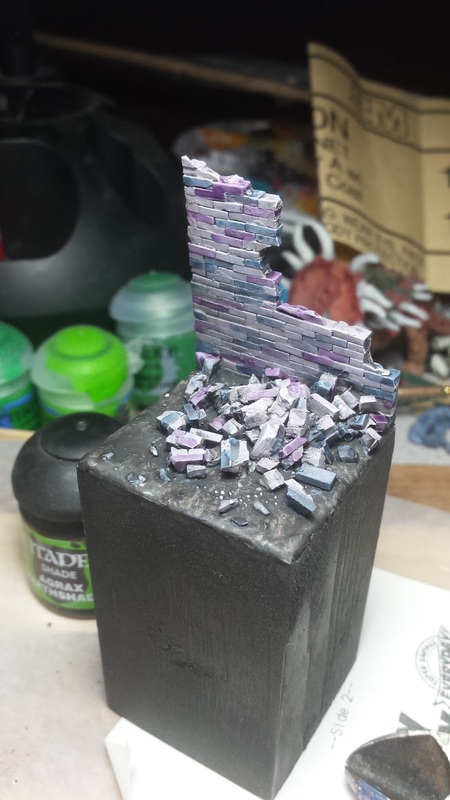 randomly picking out individual bricks with Drakenhof Nightshade and Druchii Violet. 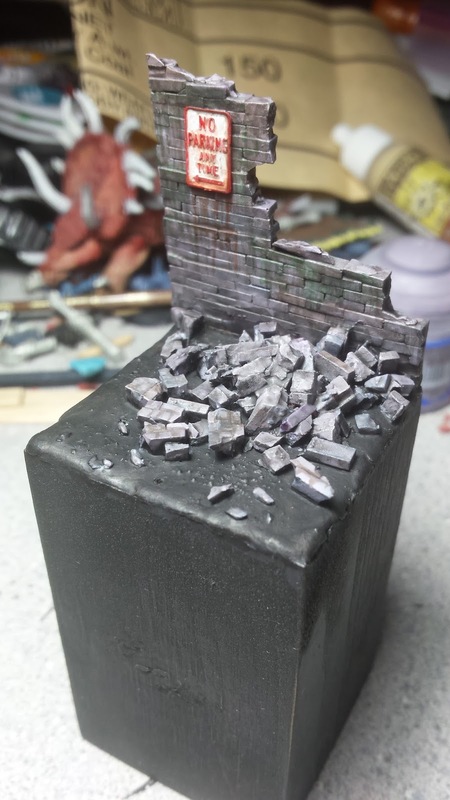 With the washed bricks dry, I then used a thin glaze of Slaanish Grey to knock down the intensiveness of the the blue and purple coloring. Giving the wall a more natural coloring to it. 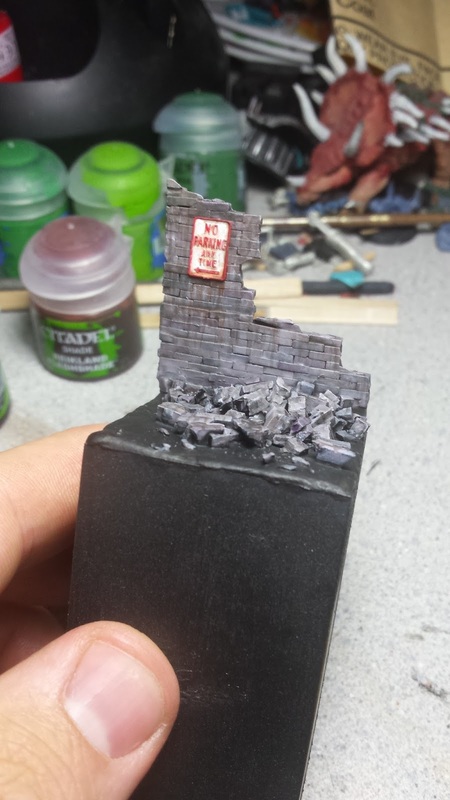 Finally, I glued the sign on to the wall and began streaking various GW washes over the surface. This gives it the look of being out in the weather and having rain water streaking dirt down it. Along with algae staining and the rust staining from the sign. I still need to come up with something for the backside of the wall. There are currently some bullet holes in the brick. But it needs something more interesting added in. 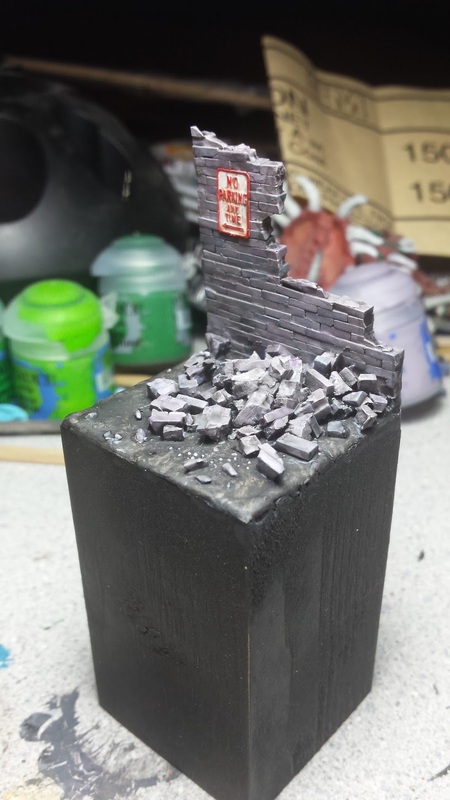 It's been suggested that I add in some graffiti to it, but I lack a working airbrush at the moment. Another thing I was thinking of was maybe some lost animal notices, or rummage sale flyers. Maybe some flyers for a fake band too. But I haven't decided yet. Either way, this project is coming along nicely. 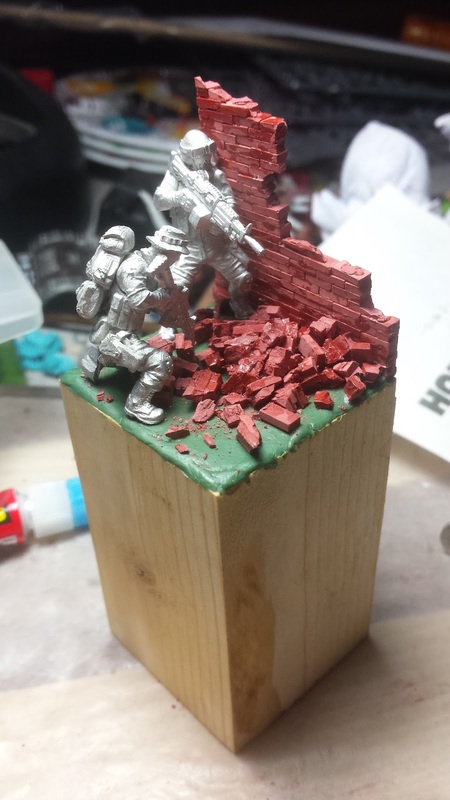 I have already started painting the soldiers and should have an update post written up soon. But, you can always follow my progress on Twitter and see what I'm working on as it happens too.